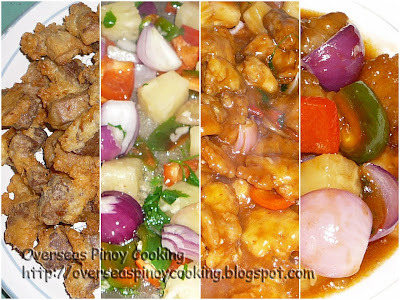 Sweet and Sour Pork and Chicken is another colorful and very popular dish. There are countless sweet and sour recipes that there is no best or greatest sweet and sour dish. Every individual or locality has their own version of sweet and sour this might not be the best for the others but it is the best in ones preference. Sweet and sour dish has become so popular that there is no standard type of ingredients except that it should at least be sweet and sour. Type and quantities of ingredients defends on available ingredients. I have made posts of several sweet and sour fish dishes which we sometimes call them escabeche. But this is my first sweet nad sour meat dish. For my sweet and sour pork and chicken, I used batter-fried cutlet of pork and chicken meat in tomato base sweet and sour sauce with pineapple. Here is the recipe. To make the batter, mix the cornstarch and baking powder in a big bowl then add in the egg, 1/2 to 3/4 cup of water, and cooking oil to form a thick batter. Add the pork and chicken into the batter stir to so the meat pieces are evenly coated with the batter. In a wok, heat enough cooking oil for deep-frying. Deep-fry the meat pieces in batches for 2 to 3 minutes in medium heat or until they turn to golden brown. Drain on paper towels and keep aside. On same wok, remove excess oil. Now stir fry garlic until fragrant. Add in onion bell pepper and drained pineapple chunks and kinchay, stir-fry for 1 to 2 minutes, remove from wok and keep aside. On same wok pour 1 cup of broth from boiling the pork, stir in reserved pineapple syrup, tomato sauce, vinegar, Worcestershire sauce, oyster sauce and sugar, bring to a boil and simmer for 2-3 minutes. Season with salt to taste. Now add in the fried meats and vegetables in to the wok, stir cook for about half a minute. Remove wok and transfer in a serving platter. I made this for our dinner and i liked the result. thanks alot for all the recipe sir!